Founded by local mum Gabi Maddocks, Movers and Shakers classes have spread across Haringey and beyond. With over 200 babies and toddlers attending each week it is one of the most popular pre-school classes in the area. At Movers and Shakers we offer music and movement classes for babies and toddlers, with a strong emphasis on creating a child-friendly and parent-friendly class. 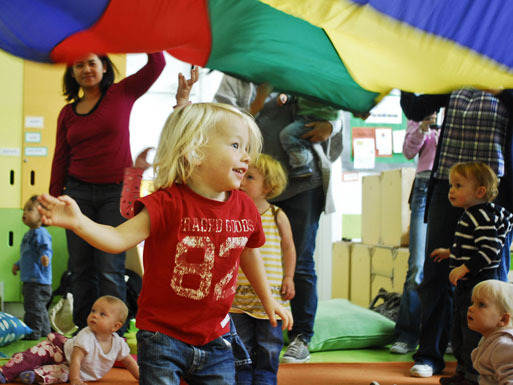 We aim to provide a safe space where parents and children can make friends, sing and play together. What happens during a Movers and Shakers class? At the beginning of each session, the Movers and Shakers class leader introduces their puppet assistant who will help out during the class. Young eyes will light up as gorgeous puppet emerges from her bed to warm up everyone’s body and voice. Then movers and shakers are ready to join in with all the songs, actions, rhymes and signs. Every Movers and Shakers session has a theme, such as Animals, Toys, The Weather or Under the Sea. To find out what this week’s theme is, all the movers and shakers come into the circle to unwrap the week’s special object. Each week, movers and shakers explore an instrument. It might be a tambourine, maracas, a bell or an agogo. They discover that instruments can be shaken, rolled, rattled and scratched in all sorts of styles and rhythms to make many different sounds. Every session ends with some fantastic parachute games. Movers and shakers are always delighted by the parachute – especially when it is their turn to explore underneath! If you are interested in joining, have a particular question or you simply want to know more about our classes, please email us at moversandshakers@theplayingspace.co.uk.